It feels like its been around for longer, but this week marks the second anniversary of Instagram Stories, the platform's Snapchat clone which was launched to much derision, but has since gone on to become a powerhouse expansion of the app's tools. Indeed, Stories marked Instagram's first real effort to push beyond its image-hosting roots. While Instagram has always made various updates and changes, the platform had traditionally been very cautious, very careful with updates and advancements, amidst concerns about altering the user experience and losing touch with its core purpose. Given this, Stories was most definitely a risk, but as noted, it's paid off in spades. Instagram Stories now has 400 million daily active users, while Instagram more broadly has gone from 500 million monthly actives when Stories was launched to a billion now. And Stories is set to become much bigger yet. In an interview with The Verge, Instagram CEO Kevin Systrom notes that the first year of Stories was about bedding down the format and aligning it with their userbase. Since then, they've sought to ramp up their activity and additions, with the view at parent company Facebook that Stories are the future of social sharing, set to soon overtake the News Feed. 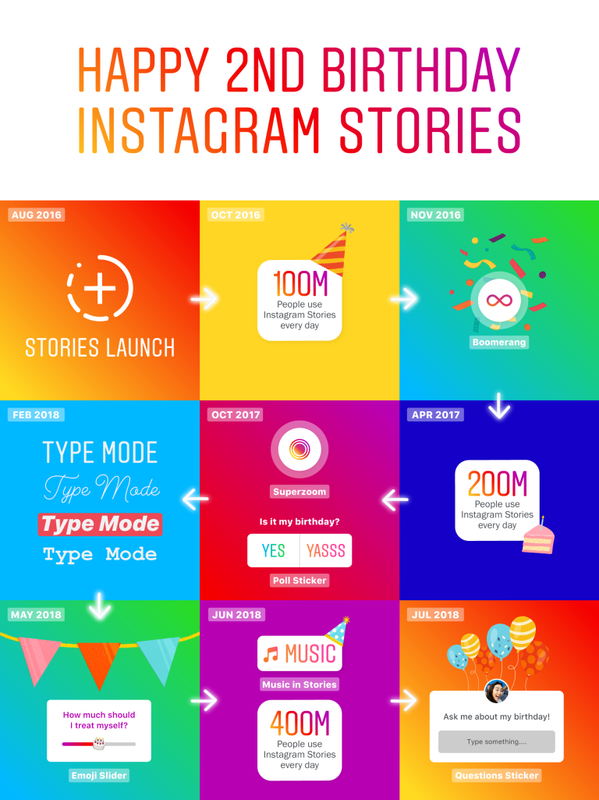 To celebrate the second anniversary of Stories' launch, Instagram has released the below infographic, which highlights some of the key milestones in the development of its Stories product.